A peach from Andres Iniesta, coupled with strikes from David Villa and Cesc Fabregas sees Barcelona make short work of Deportivo Alaves in their Copa del Rey tie. Arsenal and Reading play out one of the greatest games in League Cup history as the Gunners come from 4-0 to clinch the tie 7-5 in extra time. Walcott scored in the sixth minute of second half stoppage time to take the game into extra time, with Arsenal scoring both their match winning goals after 120 minutes. Palermo squander a great opportunity to put more pressure on Milan as the Rossoneri fight back from 2-0 down and just over 20 minutes to play to claim a 2-2 draw. Holders Borussia Dortmund progress to the round of 16 as they easily beat Aalen 4-1 in the German Cup. Christian Benteke scores a last gasp winner for Villa as they just about manage to beat a spirited Swindon Town to progress to the last eight of the Capital one Cup. One of the best moments that came from Cristiano Ronaldo in the 5-0 win by Real Madrid over Mallorca wasn’t his two goals but his interactions with the fans, imploring the fans to keep on booing and jeering him, as if it only made him stronger and better throughout the match. Maybe it actually did. Ronaldo has his ups and downs with reactions to fans, and there are days when it does actually get to him. But not in the match against Mallorca, who were either too adventurous in their approach or simply too weak tactically and in their quality to actually do any kind of efficient defending. Whenever Real Madrid tried to find themselves a chance, they made it. If Mallorca were somewhat of competition during the first half, any sort of opposition ended in the final 45 minutes, leading to three goals in the final 20. Against these kind of opponents, Real Madrid’s superb ball movement, this time orchastrated brilliantly by the quickly adapting Luka Modric, is simply too accurate, too quick and too good for the other teams to react accordingly. The second goal, Ronaldo’s first, was a combination of those quick slices and slants, Ronaldo’s finishing prowess and some poor defending from Mallroca, not doing Dudu Aouate any favors. For now, the experiment of playing Michael Essien as a left back is doing OK. It won’t be very effective against more dangerous teams, but vs most of what the Spanish La Liga has to offer, it’s fine, as there’s enough time for Pepe and Varane to react and help. Xabi Alonso has more time to spend helping the back four as Luka Modric had no problem taking over the midfield roles along with Mesut Ozil, although there’s certainly some sort of task-sharing issue between the three, as one of these players always seems a bit removed from the equation when they play together. Once again, playing most of the Spanish La Liga it doesn’t really matter. For these matches, Gonzalo Higuain is the preferred choice. Angel di Maria has no problem doing all that Karim Benzema adds to the striker position that Higuain can’t. A scorer, through and through. Nothing else, but mostly it’s enough. Di Maria is thriving this season playing in the middle, not feeling very confined to playing as a winger. It works great in the Argentinian national side and has started becoming more and more of a positive issue while playing for Real Madrid. Cristiano Ronaldo was probably having the time of his life. When there was no uphill struggle, he can hear his name being cursed in the stands all day long. There was simply nothing to frustrate him on the field, so he simply embraced the hate that was showered at him from the stands. It’s easy to look at Ronaldo’s reactions most of the time and find the negative in them. His small attempts at cheating and fooling referees can be annoying, but with one quick goal that only he can pull off he makes you forget. He shows his emotions, or simply plays a part. Whatever it is, he’s interesting to watch. He might not be the best player in the world, but it’s to find an athlete worth watching, with or without the ball, for 90 minutes and remain interested. 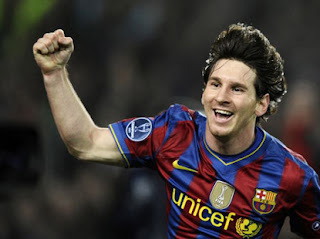 Lionel Messi undervalues ​​the two goals he scored and helped Barcelona to come out of Vallecas with a strong 5-0 win. "The most important thing is not to have scored two more goals, but the team came back to wins and that's how we want to continue. Despite the cold, we played well and did not suffer goals with two adapted central defenders [Adriano and Busquets]. Both were very well, " Said Messi after the match. With two goals in this match, Messi brings the count of the season to 13 goals in nine championship matches, overcoming the barrier of 300 (301) in his career. But not really think being closer to winning the Golden Ball: "It is a beautiful achievement but the merit is for the whole team. I share this award more with my mates because, in football, the prizes are won as a team. " Newcastle have won the race to sign France midfielder Moussa Sissoko on a free transfer, according to reports. France has proven to be a happy hunting ground for Toon boss Alan Pardew and it looks as though he is set to swoop again to land Sissoko from Toulouse. A host of Premier League clubs including Spurs, Liverpool, Everton and Fulham have been showing an interest in the 23-year-old but reports claim Newcastle have pipped them all to his signature. Sissoko is due to fall out of contract in the summer and will be able to sign a pre-contract agreement in January. However it remains to be seen whether Newcastle will pay a small fee to take him when the window re-opens or bide their time and land him on a free transfer when his contract expires. Pardew faces a battle to keep his star midfielders Yohan Cabaye, Hatem Ben Arfa and Cheick Tiote and Sissoko could be brought in to replace one of the trio. Fulham have been linked with a £12million swoop for Aston Villa striker Darren Bent after Martin Jol revealed his admiration for him. The Cottagers boss is the latest to be linked with the England international striker, who has found himself struggling for a first-team place at Villa Park under current boss Paul Lambert this season. Bent was stripped of the captaincy at the start of the season with summer signing Ron Vlaar taking on the armband, while he has only started one of Villa’s last four league games. He again had to settle for a substitute appearance on Saturday as Lambert preferred an attacking duo of Christian Benteke and Gabby Agbonlahor in the 1-1 home draw against Norwich. And with the possibility that Lambert could make Villa’s £24million record transfer signing available in the January transfer window, Jol has made his potential interest public. Meanwhile, Bent has no interest in leaving Villa and insists that, if he is sold, it will be because the club no longer want him. He told The Sun: “If they feel in January it’s time for a parting of the ways then that’ll be down to them – it won’t be my doing. Former Barcelona boss Pep Guardiola wants his next job to be in England and is keen on a London club, alerting Chelsea. Well-placed reports on Saturday suggest the former Barcelona coach wants to work in the Premier League following his year out of the game and has told friends it is London where he would feel most at home. That has led to suggestions he could be lined up by Blues owner Roman Abramovich in the summer, although current manager Roberto Di Matteo has worked wonders since taking the job on an initial temporary basis mid-way through last season. It is not thought Di Matteo’s position is under threat but, if Guardiola makes it clear he does want to work in London, Chelsea are sure to be interested such is the Spanish coach’s standing in the game. “Pep wants to manage in London and he is looking for the right project,” the Daily Telegraph quotes a source familiar with the situation. Guardiola, who led Barca to both Champions League and La Liga glory when in charge at the Nou Camp, has also been heavily linked with succeeding Sir Alex Ferguson when he finally calls it a day, while Manchester City has also, inevitably, been mooted as his next job. However, it is Chelsea who are the leading candidates at the minute while Arsenal, with boss Arsene Wenger under some pressure, have also been mentioned as a club that Guardiola could be attracted to. Roberto Mancini has insisted that it was the team’s spirit rather than his tactics that cost Manchester City against Ajax. Despite taking the lead at the Amsterdam Arena, the English champions succumbed to a 3-1 defeat which leaves their hopes of qualifying from Group D hanging by a thread. “If you have spirit you have quality to play Champions League. If not, you can’t. This is the problem. It is not important, the tactics. When you play this game you should have good spirit,” Mancini said. A squad that is blessed with the options that City have could conceivably win their remaining three games – against Ajax and Real Madrid at home and Borussia Dortmund away – although Mancini has conceded that they may have left themselves too much to do. “Now it is very difficult. We have one point and I think we have a five per cent chance,” Mancini added. “We need to win all the games and I don’t know if this is possible if we play like this. City will hope to rediscover their best form ahead of the next crucial Ajax clash on November 6 in Premier League games against Swansea and West Ham. Steven Gerrard hailed Raheem Sterling’s “bottle” after their Liverpool’s 2-2 draw at Everton. Gerrard was full of praise for 17-year-old Sterling after coming through the taxing experience of his first derby, which included Everton goalkeeper Tim Howard racing out of his goal in what looked like an attempt to get the youngster sent off for a second bookable offence. “Sterling was fantastic. He has been a revelation for us,” said the England captain. “Seventeen years of age away in a derby against a big, physical long ball team I thought he was outstanding. “The way he stands up, wants the ball and doesn’t hide is a credit to him and he’s got some bottle. “That’s what you look for in young lads. You wonder whether they have the bottle to play away from home against tough teams and difficult situations and he handled it superbly. “I don’t think the Everton players would have known much about Raheem before yesterday but they are going to be seeing an awful lot more of him in future. Cristiano Ronaldo and Gonzalo Higuain score two each as Real Madrid demolish Mallorca 5-0 to move to fourth in the La Liga standings. Roma squander a two goal lead as Udinese stage a great fightback to win 3-2 at the Olimpico, with Antonio Di Natale scoring the winner from the spot. Tachtsidis sent off for Roma in the dying minutes of the game. Bayern Munich suffer their first Bundesliga loss of the new season as they go down 2-1 to Leverkusen. This Fernando Torres red card vs Manchester United ( VIDEO BELOW) reduced Chelsea to nine men in their 3-2 loss against the Red Devils on October 28, 2012. Torres was sent off for alleged simulation by referee Mark Clattenburg, resulting in a furious altercation between Chelsea manager Roberto di Matteo, who thought his striker had been hard done by, and his opposite number Sir Alex Ferguson. Di Matteo alleged that there had been contact with United defender Jonny Evans and Clattenburg was wrong to give Torres his marching orders for simulation. Chelsea suffer their first league defeat of the 2012/13 season as they go down 3-2 to Manchester United in an eventful game. Fernando Torres controversially sent off for the Blues, who finished with nine men, while Man Utd’s winning goal from Chicharito also looked suspiciously offside. Four goals are scored in the space of 20 odd first half minutes as Everton and Liverpool draw 2-2 in the 219th Merseyside derby. Luis Suarez with a late goal disallowed for offside. Remedying United’s current defensive pitfalls is proving incredibly problematic for Sir Alex Ferguson as he approaches, what is being billed as, the seasons early title decider. Last week’s victory against the Potters at Old Trafford once again highlighted the Red Devils’ frailties at the back as did the narrow Champions League win in midweek. Annoyingly for Ferguson there isn’t much he can do treat the situation with Rio Ferdinand and Johnny Evans, both of whom have endured mixed campaigns, his only two fit centre backs. And the last thing he would want is to come up against a free scoring Blues side, who could to start pull away at the top should they win having already built up a four point advantage over United. Ferguson knows it is still early days in the title race but is also aware of the negative effect a defeat against one of their main rivals could have on his players as they struggle to find their form. This week on FFC should United think about the financial benefits of selling Nani and could Ferguson be about to raid Germany for a second time? Argentine maestro Lionel Messi surpasses 300 career goals and takes his tally for the year to 73 as he stars in Barcelona’s 5-0 demolition of Rayo Vallecano. Struggling Milan get some respite as they edge Genoa 1-0 thanks to Stephan El Shaarawy’s second half strike. After impressive away wins at Arsenal and Tottenham, Chelsea can knock over an even bigger English Premier League rival when Manchester United visits Stamford Bridge on Sunday in the highest-profile match of the season so far. The European champions have won seven of their eight league matches to power into a four-point lead, with the manner of their victories just as impressive as the results. Roberto di Matteo has been keen to play down his side's title chances at this early stage but bringing down second-place United would make that stance untenable. In a city obsessed with football the day holds about as much significance as Christmas or New Year’s Day. The streets of Liverpool bear a desolate look as every Liverpudlian hurries home or packs into the nearest bar as they wait for one of the most anticipated games in the year. A league game is worth only 3 points but this game is about so much more. The city will be split down the middle into Red and Blue halves as one of the fiercest rivalries in world football is set to be renewed this Sunday at Goodison Park. Everton take on Liverpool in the 219th Merseyside derby and this one promises to be just as memorable as the ones before it. Everton finished above Liverpool last season and have made a strong start to this Premier League campaign. The Toffees have scored 15 points from 8 games this season and look like surprise contenders for one of the top 4 spots. Everton currently lie 4th in the league table and will be looking to get a victory over their old rivals as they stake their claim to the bragging rights in the city. David Moyes has managed to get 3 points just once in the last 11 fixtures against Liverpool and he will be looking desperately to correct that stat. Liverpool had beaten Everton three times in a row last season and will be looking to extend that good run of form against their neighbours. After a difficult start to the league, Liverpool have now found some form as Rodgers’ brand of football takes shape. Liverpool have been unbeaten in their last 4 matches. They have managed to win 3 of those and have kept 3 successive clean sheets along the way. Everton are not going to be pushovers though, and The Reds will have their task cut out. It is that time of the year again, of the new 2012/2013 season. Two of the Premier League’s fiercest rivals go head to head at the fortress, Stamford Bridge. Chelsea are unbeaten this season and have a perfect home record with only one away draw. On the other hand, Manchester United have not started the season as well –two defeats already this campaign, one at Goodison Park , and the other at home to Tottenham. These games are always well promoted and hyped by the media, and the games never disappoint, at least to the neutrals. Last year’s home game was indeed very entertaining and controversial. A Johnny Evans own goal and goals from Juan Mata and David Luiz put Chelsea up 3-0 and in prime position to take three points. Howard Webb, a United fan favourite, gave the Red Devils two questionable penalty decisions and a draw with the reigning Premier League champions ensued. Let us not forget though, that it was a somewhat different lineup for the Blues last season, as well as a different manager. It is a much renovated side this year, and a definitely more entertaining one. The trio of Juan Mata, Eden Hazard and Oscar, or ‘Mazascar,’ has become fan favourites at Stamford Bridge and has not failed to entertain on many occasions. The attacking midfield trio has gelled together smoothly, much to the delight and entertainment of the fans. With a somewhat depleted Manchester United side, makeshift back four and no Nemanja Vidic, will the Blues be able to capitalize on that and get the three points? Either way, a difficult game is expected for both sides. United will look to end Chelsea’s 100% home record, while the Blues will look to bounce back from their disappointing defeat at Shakhtar Donetsk on Tuesday and increase the gap at the top of the table to seven points. Although it is still early on in the season, the outcome of this game could prove to be pivotal in the title race later on, if both teams are still strong candidates for it. Carlos Tevez’s goal on the hour mark helps Man City, who also had Micah Richards stretchered off with a serious knee injury, beat Swansea 1-0. Goals from Neven Subotic and Mario Gotze help German champions Dortmund move to fourth in the league standings as they down Freiburg 2-0 in snowy conditions.